Alarm is blarring, and I don't want to get up! I stayed up late, again. My kids have been up since 5:45 A.M. and I am T.I.R.E.D! This is a typical morning. I get up, change the diapers, take a shower, fix breakfast, make sure my oldest remembers everything on his morning "to do" list. Meanwhile, one of my toddlers is throwing food from her tray, and my (almost) preschooler spilt his milk all over the table...time to change his clothes. Oh, the bus is here..my son rushes out the door. Did he get his snack for the day, did he eat breakfast? Breakfast BREAKS is a great way to make sure your kids get breakfast in the morning, and now the company wants to give moms a break from the daily race. Breakfast BREAKS is teaming up with Denise Jonas, mom of the country's hottest band, The Jonas Brothers, in search of "Mom's Craziest Morning." Mom's simply log on to the Breakfast BREAKS website and enter their "craziest morning" story for a chance to win four tickets to one of the The Jonas Brothers' summer concerts. And if that's not enough, to truly give Mom's a break, they're also throwing in a $150 Gift Certificate to Spafinder.com. So, while the kids are busy being kids, Mom can take the day off to relax and unwind at her choice of one of 4,000 spas. The "In Search of Mom's Craziest Morning" contest will run from May 1st to June 15th at www.BreakfastBREAKS.com. One winner from four regions of the country will be chosen. 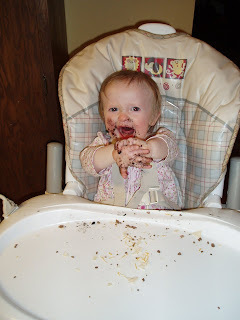 Congratulations to Jenni who won the adorable Pedoodles contest! I have e-mailed her! I will chose another winner, if I don't hear back from her. Congratulations! Thanks everyone who entered the contest! I am a total nut about cute baby shoes for my one, and only daughter. She is a doll, and deserves cute shoes! I love the Pedoodle shoe line! I wish I was rich, so I could afford one of every pair! We just got the Sweet Lady Janes, and they sure are adorable on Madelyn's little feet. She does have a little bit of growing to really fit into them, but her feet are tiny. These will be great to wear this summer with her dresses! I love the quality of these shoes! Every pair of Pedoodles is constructed of premium, top-grade, genuine leather. This flexible, breathable, natural material helps to promote healthy conditions around developing feet. The shoes don't require much care or cleaning to maintain great looks <--and that is something Pedoodles are known for. I really like that the soles are made with PedFlex™ flat-rubber to also aid in those developing feet! They are lightweight, and extremely flexible! I love that their shoes move, flex, and form to the child's feet. The shoes have no arch in them, and so it is like they are walking barefoot...which experts recommend now. And, can you just shout...ADORABLE? Pedoodles have a wide variety of great and adorable shoes for boys and girls! They offer the First Feet Collection and the Next Steps Collection. The First Feet Collection is made for the crawlers (0-12 months). They are flexible and breathable. The Next Steps Collection is for the walkers and runners (12 months-age 4). 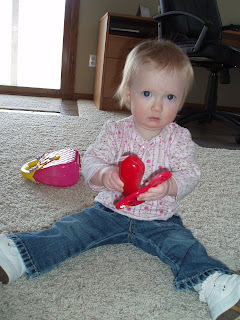 Lightweight: the shoes should not be heavy or impede the child's movement in any way. Flexible/Soft: the shoes should not restrict important toe and foot mobility, nor should they bind the growing feet in any way. Breathable: constructed of breathable natural materials, such as leather, to promote healthy conditions around the feet. Flat: the shoes should not have any arch support. They should simulate barefoot conditions. Pedoodles meet (and exceed, in my opinion) these recommendations! Pedoodles also carries, groovy hats and fun T-shirts! Pedoodles would like to sponsor a giveaway for one very lucky Sassyfrazz reader! The winner can choose from either collection and any style. This contest is for bloggers and non-bloggers and open to US and Canadian residents. Please visit Pedoodles, and pick out your favorite shoes from either the First Feet or the Next Step Collection. Come back here and leave a comment about which shoe you would chose if you are the winner. Contest ends May 13, at 7:00 PM CST. Bring on the Rain: A must read! This is a story will make you cry. Ok, I was seriously bawling! It is so beautiful to read about their faith. Their blog is called Bring the Rain. I really couldn't stop reading their posts! Their story from beginning to end is posted on this blog. The family wrote a beautiful song about their daughter, Audrey Caroline, and created a YouTube video. What a tribute to their daughter, who is now in heaven! I watched the video first, and that made me cry! Please visit their blog and listen to this beautiful song. I just cried and cried the entire time I watched this. This story isn't about the sorrow of their daughter who was only here for such a short time, but a celebration of her life and how she impacted so many lives! Please read the beginning of the story. The father is one of the singers from the Christian group: Selah. They also have 3 other daughters. I thank them for their faith! They are a complete encouragement to me! Cyber Shower Party for Margie Gunn! 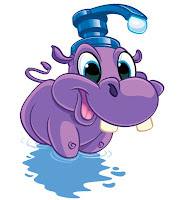 Come join the celebration from April 28th - May 2nd for fun shower games posted at Chesapeake Ribbons. This is a fun contest celebration! There are some great prizes offered! **Judging for the top 4 prizes will end at 12pm cst Friday May 2nd. Winners will be posted here, on Saturday, May 3 by 2:00 CST. (Pam, from Happy Panda is organizing the prizes)~ Thanks Pam! If you see your name listed as a prize winner please email CyberBabyShower@gmail.com and they will put you in touch directly with the sponsor offering the prize to make shipping arrangements. Here is a glimpse into my last labor/delivery story. It is a story of Madelyn's birth. Maddie is very special, not only because she is a precious gift from God, and my first daughter...but she is my little miracle baby after a miscarriage. I had very little amniotic fluid left according to the ultrasound on my due date, so they needed to get things moving. I went in that night to the hospital, and they put a pill in the nook of my cervix. Well, that really got things moving and about 4 1/2 hours later, my sweet pea was born. I did have an epidural, and she didn't respond well to that. I was hooked up to oxygen and needed to keep flipping from side to side. I was the biggest I ever was with pregnancies, so I was expecting a 9 1/2-10 pond baby. This picture of my "belly bump" is when I was about 7 months along. I know, I really should have taken a picture right before I went to the hospital. So, back to the labor...When I started pushing, it burned like fire down there...well, come to find out she was posterior (so she was sunny side up). Luckily she had a little mellon, so it wasn't too bad. When she came out, of coarse I was emotional, and the Dr. asked me how big I thought she was. I said, "Oh, 8 pounds?" The Nurse said, "No, she is little, she is more like 7 pounds." My best friend, Randi, was in there, and she took a guess at 6 pounds 8 ounces. Randi knows her baby weights, because Maddie clocked in at 6 pounds 9 1/2 ounces! What a little peanut! That was a new experience for me, because both my boys were over 8. Nathaniel was 8 1/2, and Caleb was almost #9! Her going home outfit didn't fit her until she was 3 months old. What a miracle she is! This is a fun cyber shower! I just entered two of the 4 games on her blog! Go check it out, and play, too! Here are my top 5 prize selections, in order: 8, 16, 2, 18, 3. Thank you Gunning It and Happy Panda! Caleb has been so obsessed with his God-given "unit" lately. I am not going to use the proper term, because it is private. I do use the correct term for his "unit" even though it makes Terry squirm. Terry informed me that he was down in the basement with Caleb the other night. He plays down there while Terry works on his model train layout. He wasn't really watching him, because he probably would have stopped him before Caleb said this. Caleb: "Dad, my p*nis is big." Caleb: "My p*nis is big." Dad: "Caleb, get your hands out of there! You shouldn't be doing that." Dad: "You shouldn't do that because it can make you sick." health-wise, and mentally. He should be free to know his body and explore, but there needs to be a limit. How do I teach this without making him afraid, or ashamed of his body that God created? Even today, and most times I change his diaper lately, he wants to get his hands involved. I tell him not to touch, because I am changing his diaper, and I don't want his hands dirty. There are a lot of germs in there. So, I tell him to put his hands on his head. Later today, he said, "Put my hands on my pe..." and he didn't finish, because I said, "no...on your head." PLEASE help! I don't remember going through this with Nathaniel. What is the teaching angle on this one, that is done in a godly manner? 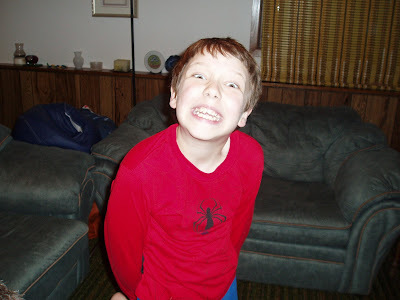 I also have Nathaniel, who is nearing puberty and those ackward teen years. Any advice? Any good books on these topics? Peter Rabbit has GONE GREEN! When I was little I loved the story of Peter Rabbit! In fact, I know there is a song...Here comes Peter Cottontail...hoppity, hop, hop! I think he was funny, cleaver, sneaky...and really he got into a lot of trouble! Well, now there is a new version of this rascal of a rabbit...he is organically safe! I love that I can feel good about this soft rabbit! Over 100 years ago, Beatrix Potter created Peter Rabbit. And to continue that wonderful culture of family and love, Kids Preferred is introducing their brand new line of Peter Rabbit plush. Not only is Kids Preferred bringing Peter Rabbit all the way from underneath the root of the very big fir tree, but Peter and his sisters are part of the brand new, Peter Rabbit™ Naturally Better line of plush. These unique products are produced in accordance with The World of Beatrix Potter™ initiative, backed by a Corporate Social Responsibility Charter, with the aim of developing products which are better for the environment, before mothers and children and better for the people who make them. 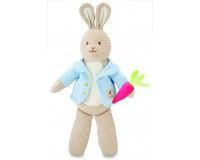 The new Kids Preferred, Peter Rabbit™ Naturally Better toys are all made from certified organic cotton, eco-friendly materials and are Phthalate free. They come in recyclable, reusable, PVC free packaging and are produced in socially responsible factories. estate. On her death in 1943 she bequeathed her farms and over 4,000 acres of land to the National Trust, England’s premier charity dedicated to conservation, heritage and learning,it should remain unspoilt forever. Peter and his sisters (Flopsy, Mopsy, and Cottontail) are part of the brand new, Peter Rabbit™ Naturally Better line of plush. Peter Rabbit is: $30.00 (18 inches tall), and his sisters are $18.00 (13 inches tall). Do you ever wonder if your computer is really safe and running efficiently? My computer has started to just chug, chug, chug along! I have come across the latest and greatest All-In-One Security! It is called Norton 360 version 2.0. I was so happy to install it and do a clean-up on my computer! We had our hard drive crash last year, and I really don't want to go through that again! For more information, click here! You can purchase Norton 360 for $79.99! I highly suggest getting it...for your own security! Here is another great contest hosted by 5 Minutes for Mom! It is a contest in celebrations of Mom! Today is the first day of their Mother’s Day Giveaway and they kicked it off with an incredible Mother’s Day gift of $1,000! For the next week, they will accept entries. 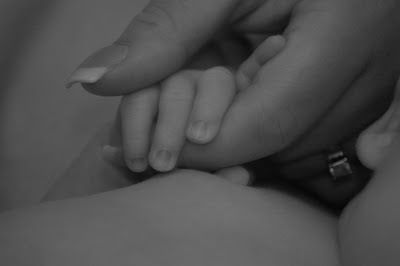 They are looking for photos that tell some sort of story of what motherhood means to you. They could be shots of you with your kids, your kids, you own mother, whatever you want. Here is my photo captured by my friend, Jennifer. She really does a super job! She knows those "precious and breathtaking" moments, and makes photos give you an impression! This is Caleb when he was a newborn. He grabbed on to my finger. I love those precious moments when they are new to the world, and seeing things for the first time. To me, this photo says so much! I think it reveals how precious and meaningful they are at this age. I think it also shows how our babies are dependant on us....for virtually everything! The little ones NEED us! We gently guide them through life, many times holding their hand, and one day they let go and spread their wings. Everything we do is an impression on them and shapes them. Only in Minne"Snow"ta! ~and other chatting. Well, it is suppose to be spring. Really, it is April 26th. Yet, we woke up to about an inch of snow! I can't believe it! I don't have a picture to post, but you can see what I mean by checking over at my friend's blog: Our Seven Qtpies, because she caught it on camera! I just want Spring to be here. It was only Wednesday that I had shorts on me and the kiddos with sandals...it was almost 80 degrees that day! Now, 3 days later it is freezing with snow. By this afternoon, a lot of it was melted away. It looks so weird because the grass is super green from all the rain, and we have the coating of snow. To me, it looks like frosting spilt all over our grass and hills. Today, Terry went to go meet up with a train club. They are working on building a layout. If you are unfamiliar with model trains, a "layout" is a big board with scenery and track. A train travels around on the track. It is quite fun to watch, because some people really work hard at putting a lot of detail into their layouts. Last year we went to a train show in Menomonie, WI. They had so many layouts! If I took a guess, there were about 150 layouts! Some of them are not small either. I saw some that had little playgrounds with kids riding on teeter totters and swing sets. The equipment moved, too! Very cool! Lights, sound, people moving, a train guard going down...very inventive and creative! It is my husband's love hobby, and I have really grown to love it too. As a family, we go and watch real trains at the train yard every other weekend. We stand about 5 feet from a moving train. It is a rush. Caleb is really loving it! Maddie does the sign for train when we go now. It is cute. All day today Caleb has been asking to go watch trains. While Terry went to work on the train set, Caleb, Madelyn and I went to see my Aunt and Uncle. It has been awhile since I have seen them. It was great to visit and see pictures from their trip out west. I really love spending time with my relatives! I wish I could see them more often. I feel lucky to get to see them today. I usually only see them once or twice a year. It was fun to catch up with them. Caleb has had a fever most of the day. Last night he complained of a head ache, and he didn't get a fever until 10:00ish. He did great most of the day, except for around 4:00. He was whiny, complained of his head hurting and a head ache, and he was hot. I really should have stayed home with him today. He did mention his ears hurting on the way home. So, I wonder if it may be an ear infection, or double ear infection. Yeah...so, on to another round of sickness. I am a little concern about him. It seems like he complains of a head ache once a week or every other week lately. He has his yearly check up the beginning of June...but I may have to get him in sooner. We will see how tomorrow goes. I may have to bring him in Monday morning. I am anxious to go get Nathaniel tomorrow. He is with his dad this weekend. It is good for him to have time with his dad, but I sure miss him when he is gone. I love finding shoes for Madelyn! I love the Buskins shoes that I just heard about. I like them because they are soft soled, lightweight, and flexible. Pediatricians now recommend that children up to two years of age go barefoot (when practical and safe). As we all know, going barefoot isn't always acceptable or safe. I would love to be barefoot or in slippers all the time. Soft-soled leather shoes serve this purpose. The soft baby shoes enables children’s feet to grow naturally and to flex when they walk. A soft-soled shoe also enables them to sense the ground beneath their feet and to grasp with their toes as they learn how to walk. These shoes vary in pricing from $15-40 a pair. Then, there are cute baby socks! 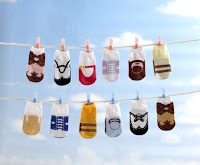 These would make a great baby shower gift for that little newborn! They are stylish and creative. They bring a new meaning to socks. Jazzy Toes are socks that look like shoes! Toes. That’s because anyone shopping for a shower gift or a new baby present has noticed that the selection for socks for boys ages 0-24 months is limited. Each pair of Jazzy Toes socks come with a non-skid grip that helps baby to walk without slipping. Each sixpair set, which contains six colors of one style—for instance, of cowboy boots—is $25 for size 0-12 months, or $27 for 12-24 month sizes. The variety pack for both boys and girls contains an assortment of six styles in various colors, and are priced at $27 for 0-12 months and $29 for 12-24 months. I think both of these products are creative, fun, very useful, and inventive! Winnie is giving a generous 10% off couponcode: “Sassyfrazz10” for Jazzy Toes. Just redeem it at checkout on jazzytoes.com. Thank you Winnie! Anyway, most of today Madelyn didn't nurse. Then tonight, she actually rejected me. I had just given the kids a bath, and I was cuddling them in bed and reading to them. She was acting like she wanted to nurse, so I lowered her down, and she spotted Caleb's sippy cup. Sure enough, she sat up, and pointed to the cup and babbled Maddie jibberish. I tried to get her to nurse, and she just got mad, so I gave her the cup. She drank some, and said, "MMM...num." Then, she nodded her head and smiled. Then, she preceeded to drink the water. I need to look at it as another Maddie Milestone. Ok, I am not a computer savvy person. I wish I was, but I am not. I have been playing with my template and the HTML~ only to lose all my sacred information on my side columns! Linda, from RS Designs, is giving me a few changes. I won a Silver Package to her site from The Good Stuff blog contest! So, I chose a third column, a signature, and a custom button. I was trying to change my template to fit into a 3 column layout tonight, and BOOM~ everything gone! I am really sad. If blogger can retrive my information...my buttons of choice, the frequently visited sites...that would be super! 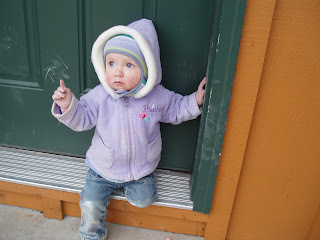 So, my dear bloggy friends, please comment, so I can add you easier! :) PS: If anyone knows how I can (if I can) get it all back...please let me know! Thanks! 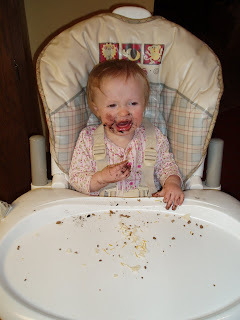 This is Maddie with her first Oreo cookie. I gave this to her about 2 weeks ago, and she was so lovin' it! She did the sign for more after she ate it! Have you heard of the Huggies NEW Cleanteam? Cleanteam helps to teach and learn happy healthy habits through playful teamwork, helping making cleaning fun. With summer quickly approaching, we really will be using these products more! I love the Huggies Brand products! For moms that understand how important it is for toddlers to stay clean every day, Huggies Cleanteam delivers fun cleaning products in an interactive, entertaining, and easy way. Huggies Cleanteam can be counted on to deliver fun and engaging toddler cleaning products in the easiest, most innovative ways, so toddlers can have fun learning how to get clean, while mom makes cleaning time happy time! 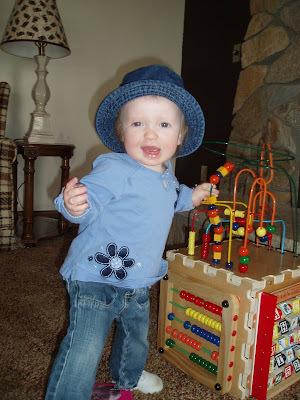 Huggies is offering to sponsor a contest! Here is what you can win: There will be 2 prize packs of three (3) products: shampoo, flushable moist wipes, and hand soap. This contest is open to bloggers and non-bloggers of the United States and Canada. 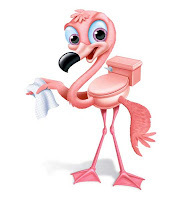 RULES: Please visit the Cleanteam, and then come back here and leave a comment with the name of one of the fun characters of the Huggies Cleanteam! This contest is open until April 28th at 7:00 PM CST! Cleanteam products are also available at Target, Wal-Mart,and some local drug and grocery stores. I am so happy and relieved that I haven't had to go through the ordeal of head lice (yet)... but, if that ever does come into our life, I am glad I came across LiceMD! Pesticide-free LiceMD helps you eliminate head lice in three easy steps without pulling your, or your child's, hair out. So you can take control of an outbreak and restore your household to its normal balance. Apply LiceMD to dry hair, then wait 10-minutes. With LiceMD still in the hair, section and comb hair to remove lice, eggs and nits. Shampoo hair thoroughly with regular shampoo and warm water. LiceMD is pediatrician tested and clinically proven to effectively eliminate eggs, lice and nits. What's more, LiceMD uses a synthetic lubricant which makes comb-out smooth and easy, even for long, thick or very curly hair. LiceMD is clear, odorless, non-irritating to skin and hypoallergenic. LiceMD is sold over-the-counter at food, drug and mass retail outlets and wherever lice treatments are sold. This review was made possible by MomCentral. Contest is now closed! Winners are Julie and Ginny! Congratulations ladies! You have been contacted! Thanks to all who signed up! Spirited young Emma Wagner chafes at the constraints of her 1850s religious community, which values conformity over independent thought, especially in women. Skeptical of the colony’s growing emphasis on preparing for “the last days,” Emma clashes with their increasingly autocratic leader—and faces the unexpected consequences of pursuing independence. This lyrical novel, based on an historical figure of the 1800s, follows the spirited and intelligent Emma Giesy, who achieves her goal of separating her family from the repressive religious community in which she grew up. But unexpected and dire consequences leave her family—and her faith—struggling to survive. This richly textured novel, the third in the acclaimed Change and Cherish series, follows the historical figure of Emma Wagner Giesy, who chafes under the restrictions of her 1860s religious colony. When her bid to belong in her unique way unravels her most precious relationships, she seeks new ways to stitch meaning into her life. “Of all the things I left in Willapa, hope is what I missed the most.” So begins this story of one woman’s restoration from personal grief to the meaning of community. Based on the life of German-American Emma Wagner Giesy, the only woman sent to the Oregon Territory in the 1850s to help found a communal society, award-winning author Jane Kirkpatrick shows how landscape, relationships, spirituality and artistry poignantly reflect a woman’s desire to weave a unique and meaningful legacy from the threads of an ordinary life. While set in the historical past, it’s a story for our own time answering the question: Can threads of an isolated life weave a legacy of purpose in community? Author Bio: Jane Kirkpatrick is the best-selling author of two nonfiction books and fourteen historical novels, including the popular Kinship and Courage series. Her award-winning writing has appeared in more than fifty publications, including Sports Afield and Decision. She’s won the coveted Western Heritage Wrangler Award, an honor shared by such writers as Larry McMurtry and Barbara Kingsolver. Jane is a licensed clinical social worker as well as an internationally recognized speaker. She and her husband, Jerry, ranch 160 acres in eastern Oregon. Would you like to win a copy of 'A Mending at the Edge'? I have two extra copies, so I will pick two winners! Open to bloggers and non-bloggers of the United States. Please tell me if you would read this yourself, or give it as a gift in your comment. Please feel free to comment everyday of the giveaway for more chances to win, but please just comment once a day. This contest will close on May 4 by 7:00 PM CST. Here is Nathaniel! He is such a goof ball lately. I think it is because he is a "Tween" Right now. He loves to read, and he is an ace student. He makes weird noises, talks/sings to himself, is EXTREMELY forgetful, is EXTREMELY loving and thoughtful, is very generous, and is bossy to his little brother. He loves frogs, caterpillars, spiders, turtles, and anything outside that crawls. He is my precious first-born son! Thank you God for blessing my life with Nathaniel! Here is Caleb! He is a little comedian. He loves to make people laugh, and he has an amazing memory. He is very smart, and smart mouthed (ahem...mine and Terry's fault). He is really starting to move into the "terrible 2's" even though he turns 3 next month. He likes to get his older brother into trouble. He is very loving and loves to spend time with people. He is my precious second-born son! Thank you God for blessing my life with Caleb! 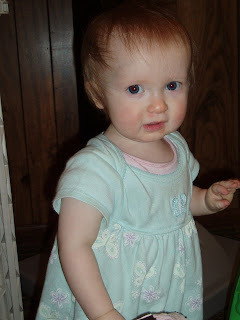 She is smart (she is signing quite a few words now) and is more mobile now that she is walking 90% of the time. She is my precious little girl! Thank you God for blessing my life with Madelyn! 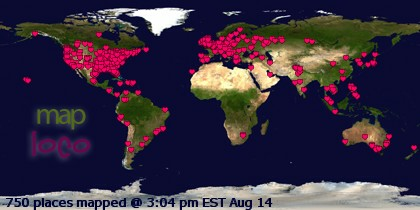 I see that I am keeping a trend of not blogging much over the weekend...until Sunday night. That is OK, right? I try to spend my weekends with the kids, Terry...and mainly family time. That is so important to me! Friday night, I did do some blogging as Terry and Nathaniel played a car racing game on the PS 2. Saturday morning, I went to WW and I had a Pound and a half gain! I really need to get my management back in order. Back to writing everything down, and measuring everything! I have to get my discipline back! I am so happy that my friends: Jodi, Anna, and Jeannie are starting WW. It will help to have "fresh excitement" around me. That is so encouraging to me. You should go to Jeannie's blog by clicking HERE! She just started a blog, and she is doing it based on her new journey with WW! Go give her some encouragement! After WW, I stopped by home, then I went to Jeannie's Tastefully Simple party. That was a lot of fun! Jodi (our mutual friend) was the consultant! She did a fantastic job! I love the Tastefully Simple products! I ordered some, and I booked a party! Saturday afternoon I did some cleaning. I wanted to do so much more, but with Madelyn it is a bit limited. Terry wanted to work outside, and he had been with the kids all morning long...so, it was my turn with the kiddos. Nathaniel had a friend sleep over Saturday night. Terry and I actually watched a movie together Saturday night, too! It was great to cuddle up on the couch together. It has been awhile. Today, we went to church in the morning. There was a bake (silent auction)sale to raise money for the Youth Group. There were plates of cookies, bars, cake, and pie...selling from $10-almost $40! That is great that our church family is so generous to make these desserts as a donation, and for the people willing to buy them at those prices to help the youth. What a blessing! We got to go on our first family bike ride this afternoon. It was so nice outside! The ice is almost off the lake completely! We rode to the park, and played awhile. Terry and Nathaniel flew the dragonfly kite, and had a great time. I wish I would have remembered my camera. I painted Madelyn's fingernails and toenails for the first time today. She sat still through all of it, and didn't really even notice it. She looks so cute with her nails all done up, so I had to do mine, too! Parking Pal: A review~and TWO giveaways! Contest is now closed! Winners are Denise and jjstringham! I contacted both of you...please e-mail me ASAP. Congrats again! "STAY BY THE CAR!" "WHERE ARE YOU?" "I CAN'T SEE YOU!" "PLEASE HOLD ONTO ME!" Have you ever said these statements or anything similar while unloading the kids from the van? Oh, it is a stressful thing sometimes to unload everyone, and worry about one of them getting hit by a car, or taken by some crazed lunatic! I was so happy to see this great product for these very fears! The Parking Pal has made my life a little less stressful...especially now that spring/summer is here. The Parking Pal is a magnet that you keep handy in your car. When you arrive at your destination, you pull out the Parking Pal, and place it on your vehicle. Then, you just tell your kids to put their hand on the hand. This is a great product to have kids focus on something. If they have something to put their focus on, they are less likely to wonder. One mother residing in Virginia began to think of ways to keep her kids focused so the chance of them bolting or wondering in parking lots would be eliminated. She created the Parking Pal and IT WORKED. Austin, her 5-year old, and Aiden, her 3-year old, love the Parking Pal. When getting out of or coming back to the vehicle they go directly to it, put their hand on it, fiddle around with it and chat with each other while she gets her youngest into his stroller or back into his car seat. Until all vehicles are equipped with back-up cameras and all until all drivers remember to pay careful attention in parking lots, this is a great aid in keeping your child safer. The Parking Pal was introduced in the spring of 2007, and another new child-safety product will be introduced this spring. Be sure to go check them out! You can purchase your own Parking pal here: http://www.kidsafetysolversandmore.com/shop.html for only $7.99! I think it is a good investment! Thank you Parking Pal for making this great product for kids to help keep them a little safer! and you can join in on the fun too...just click here. It is a great carnival to meet other bloggers and maybe win some contests while having fun! Thanks to Chilihead, at Don't try this at home for hosting another great carnival! This contest ends April 28 at 7:00 PM CST. Today was a great day! The little kids and I went to babysit Claudia. The kids were busy today. I am trying to teach them how to do the Itsy Bitsy Spider. Claudia thinks it is great, and she grins from ear to ear. She is so cute! Candace had bought the Baby Signing Time gift set, and the kids love them! When you sign the sign for baby, Claudia goes to the TV, opens the doors on the Entertainment Center, and turns on the TV. It is really funny. It is really amazing how those little kids (13 months) and Caleb (almost 3) have picked up the signs so fast! After work, I picked up Nathaniel from school, and we went to Wal-Mart. I had to pick up a new curling iron (mine wouldn't even heat up this morning) and a few other essentials. We had to get some bubbles per Caleb's request. 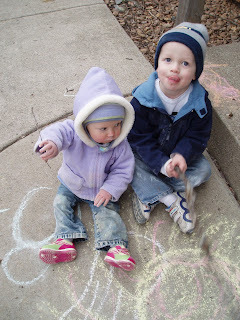 Yesterday, I had the kids outside when we got home from babysitting and we wrote all over our sidewalks and front steps with chalk. 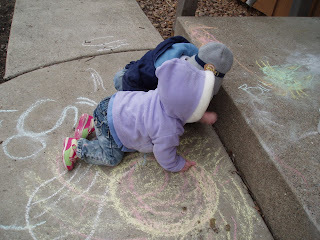 It was Madelyn's first time with chalk, and she thought it was a blast! She even wrote on the step so carefully. She only tried eating the chalk twice. She realized it wasn't very tasty, so she learned not to keep trying it. They were so dirty, but they sure had fun! Madelyn's pants were so colorful! She really doesn't care much for her hands to get dirty. I think that is so funny! The bubbles we had from last summer weren't very good. They kept popping even before they left the wand. So, Caleb asked if we can get more. So, I picked up Mega Wand (sword) wands for Nathaniel and Caleb, and a little Panda Bear bubble kit for Madelyn. Then, we walked by the kites. Caleb has been asking about a kite since February. I told him (at that time) that spring will come, and we can fly kites. I only mentioned that once, but he has got a superior memory, because he never forgot that statement. It really is astonishing to me and Terry at what he remembers. Caleb got a Buzz Lightyear kite (currently his top favorite character in Toy Story~currently is all-time favorite movie) and Nathaniel got a really cool looking dragonfly with a tail. He picked that out himself. He loves bugs and frogs...etc. There was a frog one, but he chose the dragonfly. Tonight we went to look at a little Geo Metro for a commuter car. Terry drives 45 minutes to work and 45 min. home everyday. We also drive Nathaniel 90 minutes one way every other weekend, so we needed a little car with good gas mileage. We got the car, and I think it will be a good fit for our family. There are a few minor fixes, but Terry is sure he can fix whatever is needed. He is so great at figuring out things and knowing what needs to be done. I am so thankful that he is resourceful! Do Hard Things: A Review and Giveaway! Contest is now closed! Thanks for participating! Winner is Tammy! Congratulations! Enjoy this with your home school curriculum! With over 10 million hits to their website TheRebelution.com, Alex and Brett Harris are leading the charge in a growing movement of Christian young people who are rebelling against the low expectations of their culture by choosing to “do hard things” for the glory of God. Written when they were 18 years old, Do Hard Things is the Harris twins’ revolutionary message in its purest and most compelling form, giving readers a tangible glimpse of what is possible for teens who actively resist cultural lies that limit their potential. Combating the idea of adolescence as a vacation from responsibility, the authors weave together biblical insights, history, and modern examples to redefine the teen years as the launching pad of life and map a clear trajectory for long-term fulfillment and eternal impact. 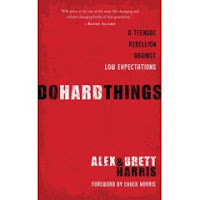 Written by teens for teens, Do Hard Things is packed with humorous personal anecdotes, practical examples, and stories of real-life rebelutionaries in action. This rallying cry from the heart of revolution already in progress challenges the next generation to lay claim to a brighter future, starting today. Alex and Brett have been featured in the New York Times, World Net Daily, and World. Their Rebelution Tour is hitting cities across the country, challenging teens to not meet but exceed our culture’s now expectations for teens. I am just starting to read this book, and it is super! God has definitely inspired these boys to do mighty things for HIM! Their older brother is Joshua Harris (author of I kissed Dating Goodbye). Whether you are a teen, parent a teen, or just know a teen, this book is an essential read. Would you like to win a copy of this great book? Just leave me a comment. Contest open to United States residents (bloggers and non-bloggers). Contest ends April 24 at 7:00 PM CST. I have been thinking so much lately about what God did for us. He gave his one, and ONLY Son...for us, for me! That is really, and truly amazing! Have you ever really thought on that? He didn't have to, He Chose to! What a sacrifice. Such love! So self-less...unconditional, love! This has been really been on my heart. I ask myself, could I sacrifice my child for others? A friend of mine, Jennifer, has some friends who just went through a horrible year only to end in the death of their 3 year old daughter. My heart just aches for their loss and sorrow. Caleb is almost 3, and I can't even fathom losing him to death at this young age. The one way I can relate to this loss, is going through a miscarriage 2 years ago this month. I was 11 weeks gestation, and I started bleeding at the Dr.'s office. It was a horrible time in my life. I still mourn my little baby. Our children are so very precious! Reading about little Anna (who just passed away) and the story of her journey to heaven, has just made me more aware of the time with my children is so precious. I don't know how long I have with them, I have what God gives me. He gave them to me...to love. They are such a blessing to me! He chose me to be their mom...what an honor! I know because of Anna's story, I cling a little bit more to my kiddos. I watched a short movie called "MOST" last year while helping with the youth group at our church. What a moving, compelling, and heart-wrenching film! It made me just shutter with fear, sorrow, and pain. You should see it (especially if you are a parent). This movie really ties in what Christ did for us. We are undeserving of the gift of eternal life, and yet Jesus took it all on himself, so that we can live! Here is a mini-version of the film, please watch it! I will try to upload the video, too...stay tuned. Taking a trip? ~AND a CONTEST! Contest is now closed. The winner is the lucky Sheila! Congratulations! I e-mailed you. Please be sure to contact me ASAP~ Thanks everyone who played along! I am so glad spring is finally (officially) here...now that it is warming up~ finally! I am really looking forward to going outside with the kids, going to the parks and pools, going camping, hiking, road trips, maybe flying? (If I am lucky enough). I am really excited about this new website I found out about called Little Jet Set! They have such a great product line to help families who like to travel....a one-stop-shop for everything families need for travel with kids.Little Jet Set provides an outstanding collection of kids’ products that foster intellectual, emotional and physical development through creative and interactive play. Best of all, their products are conducive to travel on the road or in the air to keep children organized and occupied. Many of Little Jet Set’s unique toys, games and books have been recognized for their outstanding designs, concepts and content by award organizations and publications. Parents can shop with confidence knowing they are buying products that have been tried and tested! Little Jet Set has more than 60 brands to choose from and shop by, in case families are fans of favorite names. Madelyn. I love that I won't need to use one of those disposable swim diapers by using this swim suit. It has a built-in cloth diaper (washable)! I think it is super cute, too! I also have the Art-To-Go roll (in the cow print) by The Piggy Story. This is a great, and handy art kit to keep in the diaper bag. It is a cloth with pockets to hold the crayons in it. You just roll it up and tie the leather straps. I really like that it keeps just my children's germs on it, and it is always available no matter where we are. My kids love the Farm Animals Magic Color book. They really think it is neat how the page becomes colorful when you pull it out from the book! I think that this invention is great, too! Would you like to make your traveling a bit more stress-free with the help from Little Jet Set? Little Jet Set is sponsoring a giveaway for the Space Adventure Magnetic Board Book! You can be a blogger or non-blogger resident of the United States to participate. Look around and find something you would use with traveling with your kids...you will find a LOT! 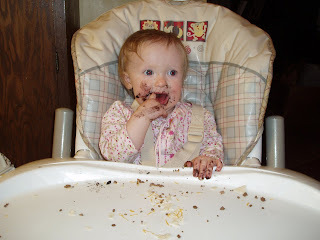 See the whole blog party going on...so many to sign up for! Alicia tagged me for 7 Random things about me, and I just did this last month. Here is my post that I did for that. CLICK ON THIS. Thanks Alicia! It is great to read your blog, and interact! I think you and your husband are doing such a great job...teaching is such a rewarding occupation! I bet you are great teachers! God bless! Madelyn loves to eat. I try to not just feed her what I will eat, but try to give her good variety and lots of colors. I think this will help her broaden her tastes. There are many things she doesn't like, but I will just keep introducing them to her. I have been teaching Madelyn and Claudia 'Ring Around the Rosey' and at first Madelyn was not interested at all. Well, yesterday, I stood up and said, "let's do ring around the rosey." Caleb and Claudia came over and grabbed my hands...then, here came Miss Madelyn. She was happy to come and join us now. It was precious! She stood up, and Claudia reached over to grab her hand. Madelyn wasn't really in the mood for hand holding, but it was cute nonetheless. The kids all laugh and giggle when they "all fall down!" Madelyn is starting to talk now, too. She says thank you: Ta, Ta; she says love you: La, lu; she says diaper: dai, dai; she says Dad: dah, dah; and she says Mom: ma, ma. She is so cute, she tries to say so much, and she gets mad if we aren't listening. She will talk to us about getting her drink. If we don't catch it, she starts yelling and getting mad at us. It is really funny, actually. She is also giving hugs and kisses. If you ask her for a kiss (most of the time) she says, "Mmmm..." and kisses~ with mouth wide open. Also, if you ask for a hug, she will hug with all affection, and even lay her head on your shoulder. Once in awhile, she will pat my shoulder. It is so heart melting! Baby clothes that are "Uncommonly Cute"! Madelyn is the Queen of Drama!! She is all girl, through and through! She is the little princess who will throw a fit if things don't sway her way! Seriously, she can have a temper. I believe I have a strong-willed child here. She may be little, but she can sure hold her own! 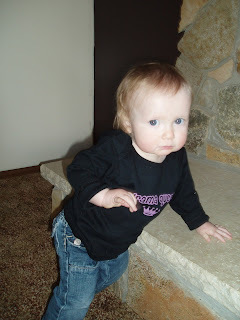 I am glad there are cute baby clothes for little Divas with 'tude! Uncommonly cute has many hip, fun and cute (baby) clothes for newborns, infants and tots! I love fun baby clothes! Someday I will have to order this one on the right for Madelyn! It will be fun to let the news out in a subtle way...huh? They offer onesies, short sleeves and long sleeve shirts, and they even offer shirts for twins. The sizes range from Preemie (up to 7 pounds)- Size 6 (up to 45 pounds). Who is the wonderful lady who came up with the Uncommonly Cute shop? Allison Friedland put her MBA and marketing background to good use and created Uncommonly Cute on behalf of all the speechless babies subjected to the humiliation of having to wear clothes that clearly contradicted their personalities! Uncommonly Cute's t-shirts and onesies not only afford babies a sense of individual style-be they a Diva, a Rock Star or a Fashionista-but comfort as well. Each garment is made of 100% combed cotton and is super, super soft. Sure to delight the babies' no-fuss, socially conscious moms, the clothes are all machine washable, safe, durable and made in sweatshop-free American studios. Momma Mia! : The Search for the Dynamos Contest! Attention: ALL WOMEN 4o Years old (and older) ~~ Check this out!! Pond's has partnered with the big screen remake of Mamma Mia!, starting Meryl Streep and coming to theaters this summer. Women 40 and older are invited to form a singing trio to perform their own take on the classics "Mamma Mia" or "Dancing Queen" and submit videos of their performances via the Pond's website, which also houses music and lyrics you can download to rehearse. I really wish I was 40 years old for this contest! I love the songs Mamma Mia and Dancing Queen! Plus, who wouldn't try to win a lavish trip to London to live the life of 3 Dynamos at the world premiere of MAMMA MIA! It's like American Idol for grown ups, but designed for amateur karaoke enthusiasts who just love the music from Mamma Mia! Add two friends and a digital camera recorder, and you're in business! Check out the Pond's site for more information by clicking here. The trio of women who best embody the sassiness, sexiness and confidence of Donna & the Dynamos from the movie, MAMMA MIA! Pond's believes all women have a Dynamo in them - share yours and you could win! Polkadot Patch Boutique offers so many great clothes for the unique and funky baby! Owner and creator, Marianne Mullen, wanted to come up with a whole new line of children's clothes where girl's didn't have to wear pink, and boys didn't have to wear trucks. She wanted high quality, Whimsical, and affordable clothing for her daughters, so she created Polkadot Patch Boutique. Polkadot Patch also supports Prevention of Child Abuse by donating a percentage of their sales. I got this "Made Ya Look!" shirt for Madelyn, and she thought the pictures were funny. Caleb thought it was a fun shirt, too. I like that Polkadot Patch Boutique offers such a wide variety of clothing, accessories, gifts, rain gear...etc. **Polkadot Patch Boutique has a promise that your kids will like their clothes! We really like our shirt, and it has a fun design! Sorry I have been away from blogging a few days! I have been off the computer more. Friday night I went to Ladies Night out and it was a blast! We laughed so hard playing games! We had a good turn out for the night, too! Thank you ladies for a wonderful and fun-filled night! Saturday, we had a train show. Terry and I have a business (a Hobby Store) that we are slowly getting up off the ground. We haven't done much with it over the winter, with kids being sick and the shop not really ready. So, we tried to sell some items at the show. It wasn't a very good turn out for people, but that is ok, because we didn't have a whole lot to sell. We did get more exposure, though. We did sell some product, and made some more sales after the show, so that is good. Saturday night, we had a yummy treat at the DQ. I haven't been there in a long time, so it was a fun treat. Sunday, we went to church in the morning. Teen Challenge was there with testimonies and singing. It was great and inspiring to hear them tell how God has broken them from their addictions. It will be a daily and life-long journey for them, but with God they can have their chains broken, and be forgiven! My brother has gone through this very thing, and so it is close to home for me. Sunday afternoon, Terry and Caleb took a long nap, then we went to watch trains. That is always a fun time with the kids. Madelyn saw the train, and she did the ASL sign for train! It was so cute, and amazing that she picks up the sign language like that! By the way...speaking of Signing Time~ They have an amazing event going on right now! Signing Time has an amazing promotion right now! You can purchase the Baby Signing Time Gift Set between April 1st and May 31st and you will automatically be entered into a drawing to WIN one of four prizes! This is a great deal! Tonight, I went to my MOPS group. We had speakers there talking about parenting. It was absolutely wonderful, and I wish the night lasted longer! I will have to share more of it later this week. It is now almost 12:30 AM and I need to get some sleep. My kids are starting to feel better. Madelyn still has a really runny nose, but other than that, I think we have allergy issues. NovaSure: Dare to Wear White Campaign! Do you struggle with heavy periods? Are you a woman over 30 and done having kids? There are some options available to you if you struggle with these health issues! For this last option, NovaSure Endometrial Ablation is the leading choice with more than 500,000 patients successfully treated. The NovaSure procedure is a quick, safe, simple, one-time endometrial ablation treatment. This minimally invasive procedure controls heavy bleeding by using energy to remove the lining of the uterus. The procedure takes about 4 ½ minutes, and only needs to be performed once to lighten or stop your periods. No pretreatment is necessary; it can be performed any time during your cycle, and most women resume their normal activities within 24-48 hours. The Medical term used for Heavy Periods is menorrhagia. A dictionary will tell you it means excessive or prolonged menstrual bleeding. A doctor will tell you it’s a medical condition that can have a number of causes. Generally, menstrual bleeding lasts 4–6 days and totals about 5-6 tablespoons (80 ml). Bleeding that lasts a long time and/or interferes with normal activities. Having to use double protection (a tampon and a pad). Having to change protection more than every 1-2 hours. Blood clots in the menstrual flow or constant pain in the lower abdomen. Getting periods more often than every 21 days. You can read HERE to find out what may cause menorrhagia. Dare to Wear White has options for those who suffer with heavy periods. Please go to their site and take their survey by clicking HERE to see if you suffer from menorrhagia. The first 250 women to take the survey will receive a $10 Amazon gift certificate. This survey is only for women who have heavy periods AND are done having children. This Tour is provided by MomCentral. Matchbox Introduces Exciting Spring Line! Matchbox is introducing an exciting line of role play toys allowing kids to emulate their real life fire fighting heroes with a value-packed collection of fire-themed play sets and role-play gear. I received two of the new products: Mega Rig Blaze Brigade building system and the Super-blast Fire Hose. Caleb had a lot of fun playing with these! The Building system is a fire truck that can be made into twenty separate fire fighting vehicles. 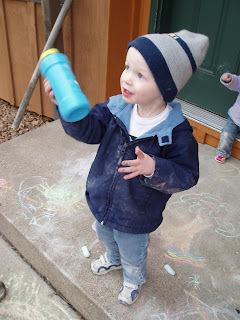 Caleb likes to hit the siren, raise the ladder and put the water cannon and shoot out the spray of water. There are a lot of pieces, so it can be a bit for cleaning up and keeping track of everything. Just like the other Mega Rig vehicles, you can break this one down and build it up any way you like. For ages 4 years and up, and retails for only $19.99. The SUPER-BLAST Fire Hose lets kids aim at the "flames" and can hit their target with soft foam balls to replicate the water hose action. 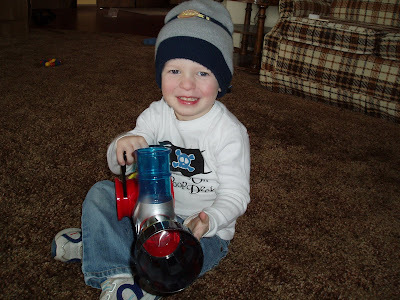 Caleb likes to pop the balls into the blaster and pull back to shoot them up to 15 feet, especially at his dad! This is a great and fun toy. I really liked this one from Matchbox! For ages 3 years and up, and retails at $17.99. I think over all their new line is fun and innovative! It creates a sense of imagination and role playing. Caleb says he would like to be a firefighter when he grows up, and this helps him play his dream out as a child, and have fun with it. He loves it! 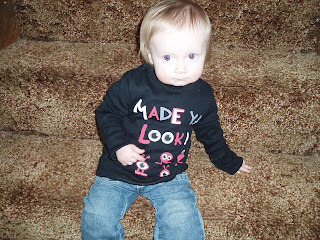 Little Yaya's Boutique: Review and Giveaway!! Friday walk with the kids...Scootababy helps! My friend is such a great photographer!